Maybe I spent too much time in France as a child, but the thought of life without cheese is unfathomable. I live in fear of becoming lactose intolerant. Foie gras, bacon, fried chicken, hamburgers, lamb chops . . . .
Plus, I really hate tofu. Everyone says this is because I’ve never had good tofu, but at this point I’m going to go out on a limb and say I probably have. I’ve had it deep fried, marinated, grilled, sautéd, and cooked in sauce. 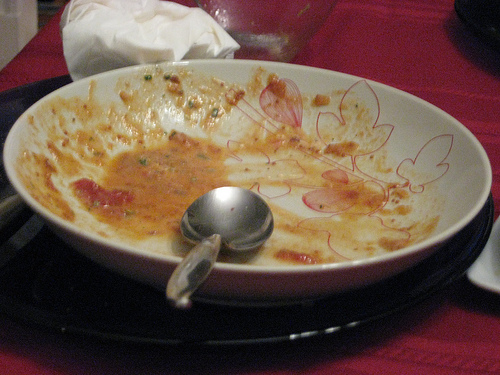 I’ve eaten it in Indian food, Thai food, Chinese food and lasagna. And you know what? It still always tastes like tofu, which is to say like not much of anything but with texture issues. I’m sort of okay with silken tofu being substituted for cream cheese or plain yogurt in dips and smoothies, although absent a really compelling medical or religious reason I sort of fail to see the point. The thing is, I know that the process by which foie gras is made is cruel and that most commercial farms keep animals in terrible conditions, and my deep dark secret is that I don’t really care. I’m all in favor of the humane treatment of animals, just not so humane that they don’t eventually end up artfully arranged on my dinner plate. I was thinking about this on Sunday as I stood in my grocery store weighing the relative moral merits of free range lamb versus the carbon footprint left by importing it from Australia. Ultimately I bought it largely because there wasn’t another kind of lamb on offer and I didn’t feel like trekking down to Whole Foods to see if they had anything more local than Australian lamb. It got me thinking though about an article on free range and organic produce I read recently. Organic and free range are very loaded terms these days, and often don’t really mean what we imagine they do. In the US the term free range is only quasi regulated. We feel good about ourselves for buying it, but it honestly doesn’t mean as much as we’d like to think it does. Free range meat is defined as coming from any animal that had the opportunity to walk around. This conjures up images of flocks of chickens roaming around a picturesque barnyard, but in reality it’s more likely to mean that for 15 minutes a day a small door in their cage is left open thus technically giving them the opportunity to leave their cages if they wanted however unlikely or unable they are to actually do it. How expensive the meat you’re buying is usually tells you exactly how much freedom and range it had during life. 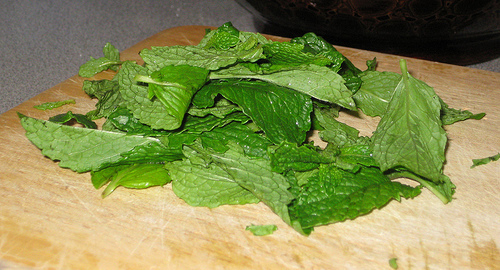 Organic is a regulated term (by the National Organic Program as it happens). But, having become a process that involves USDA certification it has also become a process that is open to lobbying, short cuts, and biases against small local farmers. And frankly, a lot of the things that get certified organic are deeply dubious. In 2007 Anheuser-Busch’s Wild Hop Lager was certified organic despite the fact that it uses hops grown with chemical fertilizers and spayed with pesticides. Meat and dairy that comes from Whole Foods is better than most, probably better than what Stop-n-Shop calls free range and organic. The Whole Foods chain has a set of terms and conditions for it’s vendors to be internally certified as free range and organic and it does try to buy locally, but without a lot more research I couldn’t tell you how rigorous the process is. However, given the price difference on free range lamb between Stop-n-Shop ($3.99/lb), Whole Foods ($5.99/lb) and a local farmer ($15.99/lb) I know which lamb I think had the best life. If I’m going to get guilt tripped into spending the extra money on free range, organic produce I want to know that it really is free range and organic, which usually means local, which in turn means a farmer’s market. Come May the farmer’s market at Government Center starts up again and I’ll be able to get beautiful guilt free meat from a farmer who comes in from Western Mass. However, between now and then I’m not willing to spend six hours driving out to the far end of the state and back for 4lb of lamb. Nor, honestly, am I really willing to go down to Whole Foods for my meat when I don’t think it’s all that much more humanely treated than what I get at my local grocery store. 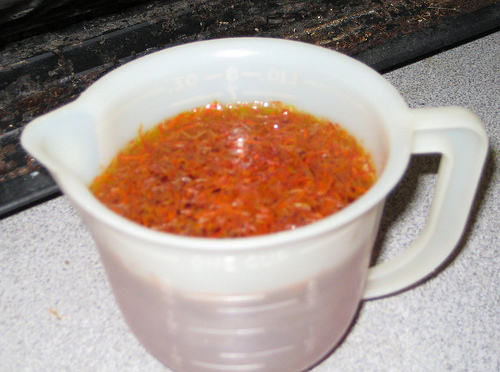 Place 1/2 cup warm water and saffron in small bowl; let stand at least 20 minutes to infuse. Sprinkle lamb with salt and pepper. Heat oil in heavy large pot over medium-high heat. Working in batches, cook lamb until brown on all sides, adding more oil as needed. Transfer lamb to large bowl. 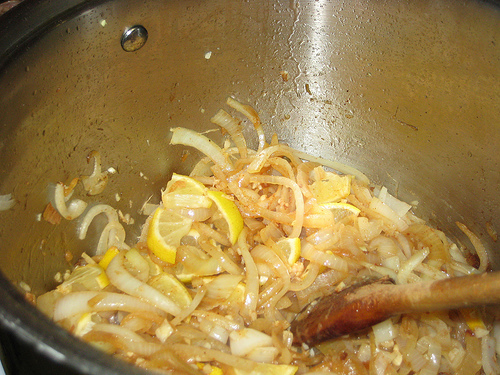 Pour all but 1 tablespoon fat from pot (or add 1 tablespoon oil if dry); heat pot over medium heat. Add onions; sprinkle with salt and pepper. Sauté until beginning to brown, about 5 minutes. Add lemon, garlic, ginger, cinnamon, and cayenne. Stir 1 minute. Add saffron mixture; stir, scraping up browned bits. Add tomatoes with juice, figs, and lamb with any juices to pot. Stir to coat. Add broth. * If you can’t find dried figs I think dried apricots, prunes, or even raisins would also work. I used about twice the recommended amount because I’m that fond of figs. I was skeptical about the topping with the stew the first time I served this, but it really makes the dish so I highly recommend trying it. Notes: Lamb is very fatty. When I cut up my lamb I trim a lot of the fat off of it, but if you refrigerate the lamb when you go to reheat it you will find that a lot of fat has floated to the top. You can remove it if you like, or if there seems to be an egregious amount of it, or you can just let it melt back into the stew and enjoy the fatty goodness. I know lemons complete with rind and pith sound like an odd ingredient, but they more or less dissolve in the stew and are really subtle in the finished product. I can’t get Meyer lemons in my grocery store, so I just try and find a reasonably thin skinned lemon to use. I’ve personally never made a stew I thought needed more liquid, and I usually take the top off and let the extra liquid evaporate off as the stew cooks. I like to be able to eat my stews with a fork and some bread for the gravy, and while this stew surprisingly has no flour in it for thickener it cooks down to a meaty jammy goodness if you let the extra liquid cook off. We just had the lamb stew for a dinner party. Rave reviews all around. I have pointed our guests to the website for the recipe. 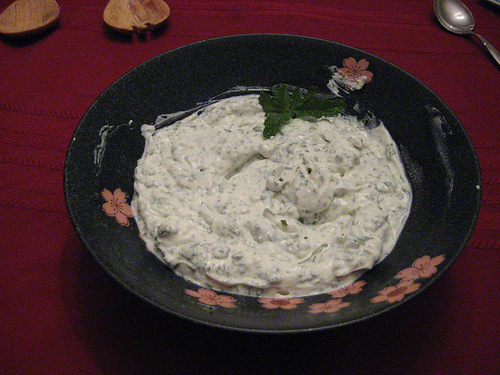 I agree that the yogurt and mint makes the stew. I am looking forward to this week’s post to see what we will have next. We currently live in Malta and had that delicious lamb stew served to us for dinner last night by some friends who live here in Lapsi Street. The spicing made me think of the tajines we often had in Morroco and I wonder what it would be like made with preserved lemon rather than fresh. I love to cook as well and am so happy to have been directed to your site by one of your biggest fans. We’ll be checking it often for recipes as wonderful as this one. I’ve never actually had preserved lemon, although it always sounds delicious and I’d like to try it. I’m glad you liked the stew.